EngiNerds Save the World | Kid Reporters' Notebook | Scholastic Inc.
Lerner, who wrote EngiNerds (Aladdin, 2017), was referring to a topic on many people’s minds: an increasing need for expertise in science, technology, engineering, and math. His new middle-grade novel helps kids explore science in a fun, imaginative way. 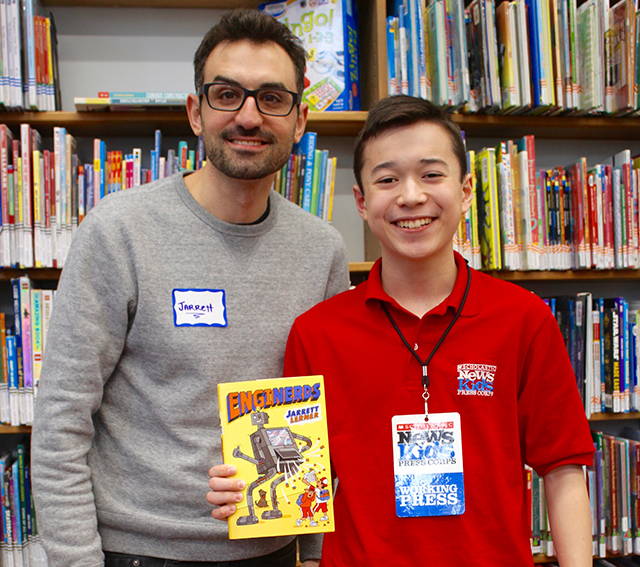 The author recently visited the Dedham Public Library in Massachusetts to talk about EngiNerds, which is about a group of boys who use creative problem-solving to defeat highly-destructive, farting robots. A finalist for the 2018 Global Read Aloud, the novel is also about friendship and working together. My parents are both university professors, so I hopped around from college town to college town, from State College, Pennsylvania, to East Lansing, Michigan, to Palo Alto, California, and then here, outside of Boston. Who are some of your favorite scientists? I’ve always loved and been inspired by Albert Einstein. His creative approach and valuing of the imagination and creativity, while also respecting the exactitude of science, was something very inspiring. If you could invent a real robot, what would you want it to do? My dream robot would do the two tasks that I like the least. It would shave my face and clean the cat’s litter box. What message do you hope kids take away from reading your book? The world is full of potential and possibilities. The kids in my books use chopsticks and rubber bands to make catapults and end up saving their town and maybe even the whole world. Instead of seeing chopsticks as just something to eat with, you can see them as something to build something out of. Also, teamwork is a better way to solve a problem than addressing it on your own. Read stuff that you’re interested in—stories like the ones you’re interestested in writing—and read beyond your comfort zone. It will help you get new ideas and develop your ideas. It will challenge you to think about your own writing in more productive ways.